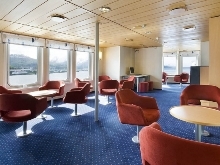 Ocean Nova has capacity for 72 passengers accommodated in comfortable outside cabins. 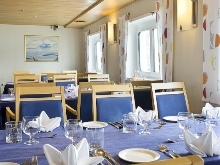 The ship offers three categories of accommodation: dedicated Single cabins, Twin cabins, and Triple cabins, and all cabins feature a picture window, a writing desk with chair, a wardrobe, individually controlled heating system, and a private bathroom. 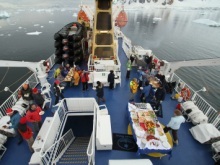 * Cruising Speed: 12 knots in open water. * Spacious dining room with unreserved seating: buffet-style breakfast with table service; table-service lunch and dinner with main course choices from a changing daily menu; cakes served in mid-afternoon. 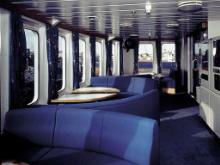 * Glass-enclosed observation lounge and presentation room. * Lounge and bar, open late morning, afternoon and evening with a wide selection of wines and spirits; coffee, tea available all day. * Library with collection of polar-themed books.